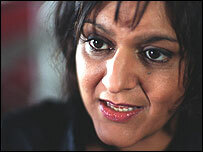 Meera Syal, comedian and writer, is joining the ranks of authors recommended for study for young teenagers. But heading for classroom obscurity are such illustrious names as WB Yeats, Anthony Trollope and Lord Byron. The latest review of the curriculum for 11 to 14-year-olds in England includes a new list of approved authors. This includes writers from "different cultures and traditions" - for the first time including Meera Syal. The 45-year-old writer and performer, who appeared in the comedy Goodness Gracious Me, is now part of a recommended group of authors whose work speaks with an "authentic voice" about other cultures. Her books, providing a bitter-sweet insight into multicultural Britain, include Anita and Me and Life Isn't All Ha Ha Hee Hee. Ms Syal, born into an Asian family living in the English midlands, has also written film screenplays including Anita and Me and Bhaji on the Beach. This list of authors illustrating different cultures also includes Anita Desai, John Agard and Benjamin Zephaniah. The proposed new-look curriculum also has a list of 20th-Century authors which define the "English literary heritage". This includes such stalwarts of the set text as Graham Greene, Ted Hughes and Wilfred Owen - but also now includes the Welsh poet Dylan Thomas. Kate Chopin, an American 19th-Century writer, also now appears in the selection of classic pre-20th-Century authors. However a slimmed-down list of authors sees some famous names being removed from the approved texts. The Irish poet and playwright WB Yeats is no longer on the recommended list for this age group. And also heading for the exit are Anthony Trollope, Christopher Marlowe, EM Forster, Harold Pinter, James Joyce, Evelyn Waugh and Lord Byron. Meanwhile, there is still a core of set text authors whose names are automatic selections for the team sheet. William Shakespeare is still going strong - alongside Jane Austen, Thomas Hardy and Charles Dickens.